Zurburan’s fascinating, austere Still Life with Citrons, Oranges and a Rose hangs directly opposite the entrance of its period room so that it commands your attention as soon as it comes into view at the Norton Simon Museum. When I saw it a few weeks ago during our visit to the museum in Pasadena, I immediately recognized the work from its visit to The Frick a decade ago. What I actually remembered was Peter Schjeldahl’s review of the show and his justly ecstatic paean to this particular painting—similar to his raptures over Morandi in another essay. It’s simple, spare, and as perfectly balanced and restful as a Matisse, but also full of mysterious grandeur, in an almost ironic way, since it’s a depiction of the most commonplace things. 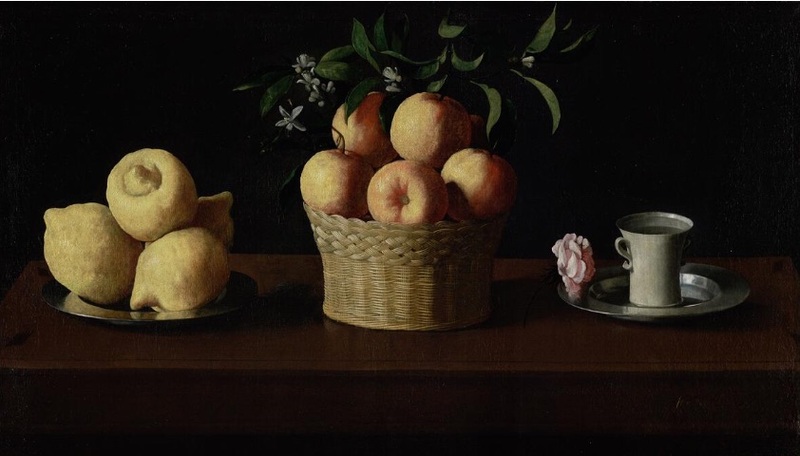 It’s a surprisingly large painting by traditional still life standards, close to four feet wide, so that the depicted objects are larger than their actual size. The layers of Catholic symbolism—the objects standing both for the Holy Trinity and the Virgin Mary—has little resonance now and yet the painting’s power and subdued beauty hasn’t diminished. Its simplicity feels as integral as ever, as if it embodies some kind of alternate mathematical axiom—five + seven + three = one. Stripped of its religious symbolism, it continues to shine with its intended spirit, as if Zurburan’s religion was merely a way of climbing a ladder, as an artist, to quotidian serenity not limited to its theological expression. The ideas have fallen away leaving the perceptual power of the image to keep working on the viewer and marvelously urging the same orientation toward the world as the ecclesiastical one. The lesson has faded, but its wisdom remains: humility, self-abnegation, attention to the abundance of ordinary experience, and gratitude for any glimpse of ordinary goodness and truth and beauty. Both artist and viewer marvel at the generous luxury of the earth’s simple gifts, its fruit and flowers. These subjects still look like offerings on an altar but at the same time seem to be just the opposite: not sacrifices, but gifts going in reverse, from a greater to a lesser power—from one who can make a lemon to one who can make a picture of one—offered to whomever stands before them as sustenance for either body or spirit. In other words, even without all the intellectual trappings that gave Zuburan a pretext for making this painting, they pass along the same monk-like devotional intensity—in the assiduously achieved formal qualities of the painting, the long hours of solitude in the studio—without consideration of his religious justification for painting them. They stand as an example of how the greatest art embodies a life that spills up over the lip of every meaning and purpose meant to contain it—and meant for it to contain—conveying a quality of attention that operates as a moral and spiritual corrective in and of itself. A great still life conveys psychological qualities that have moral consequences—silence and calm. The painting stands as one of the supreme justifications for the still life genre—not nearly as congenial and charming as Chardin, but just as magical as the French master’s best. The humblest and most commonplace objects, simply by reflecting light a certain way, seating themselves naturally in their space, bearing the pull of gravity in their own particular ways, can convey the quiddity of life itself, long before the mind has time to go to work breaking down what it sees into what it ostensibly means and, in the process, gets further and further from the actual work—and life—itself.